Michael & Sons address, phone, website, hours of operation, and more. In 1984 Michael and Mary Lorenz started what is today Northern Nevada’s best kept secret, Michael & Son’s Native American Art and Fine Jewelry. The business is now owned and operated by their youngest of three children, David Lorenz, and his wife of twenty years, Shannon. Since 1990, when David and Shannon purchased the 400 square foot store located on the Reno Sparks Indian Colony the store has grown to over 2100 square feet and a staff of 13 employees to help you with all of your needs. The store features a unique combination of fine jewelry, art and Native American jewelry. Michael & Son’s also has the areas largest jewelry repair facility and Northern Nevada’s only AGA certified Gemological laboratory. In addition, Michael & Son’s is a proud sponsor of the University of Nevada and is an official licensee for Nevada Wolf Pack Jewelry. 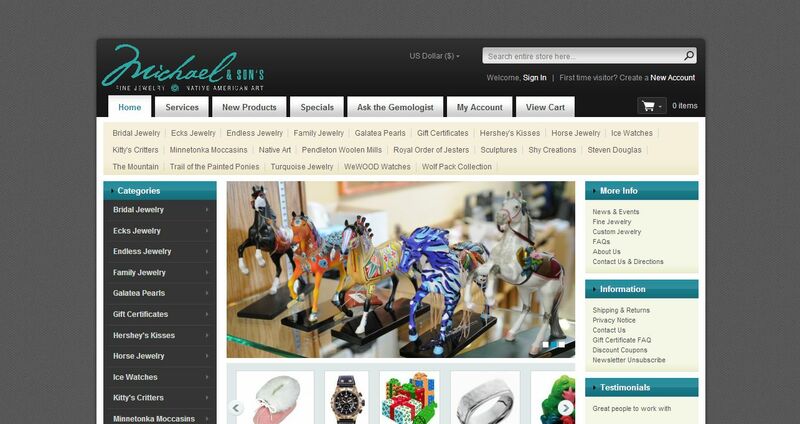 All Wolf Pack Jewelry is designed by David and is manufactured in our own jewelry department. Our staff offers years of expertise in the retail and jewelry industry and is committed to making your shopping experience a pleasant one. The customer still comes first at Michael & Son’s.